The Cauvery Water Disputes Tribunal award has predictably evoked a strong reaction from all sections of the public in the state. It is strange that Tamil Nadu has been awarded 419 tmc. ft. of water against 270 tmc ft to Karnataka even though the length of the river flow in Karnataka is more than that of Tamil Nadu. The status of being a lower riparian state has earned Tamil Nadu an abnormally higher share of water meting out gross injustice to Karnataka. Ever since the Cauvery dispute between Karnataka (then Mysore) and Tamil Nadu (then Madras) began about 125 years ago, Karnataka farmers have been the victims of the dispute. They were and are always at the receiving end, while Tamil Nadu farmers have been enjoying the major share of water, resulting in increased irrigation area in that state. Though Karnataka contributes 56 per cent of the total flow of water against 34 per cent of Tamil Nadu’s contribution, it enjoys 66 per cent of irrigated land against 32 per cent in Karnataka. This was due to the imposition of some very unjustifiable agreements by the then rulers on Karnataka that prevented it from increasing the irrigated land. These agreements were in force till 1974. After 16 years, the final award has been given and it shows Tamil Nadu’s strong hold on those that matter. The award has tolled the death knell on the farmers of Karnataka, as it has deprived the state of a reasonable share of the Cauvery water. The tribunal has gone to the extent of giving even Kerala’s unutilised share of water to Tamil Nadu. As a result of this injustice, Karnataka is today witnessing strong protests and widespread discontent amongst the masses. 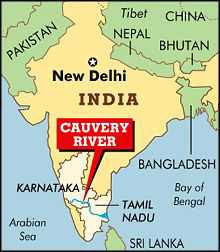 The verdict of the Cauvery water dispute tribunal has sent shock waves down the spine of non-Kannada people –– specially among the Tamil-speaking residents of Bangalore. Such fear psychosis is kept alive by hoodlums who flourish in such environments. I believe that the biggest error Pandit Nehru, in his otherwise visionary reign as PM, made was the division of the country on linguistic lines. Nearly sixty years after independence, we Indians are finding it extremely difficult to think about ourselves as nothing more than Tamilians, Kannadigas, Telugus, Malayalees, etc. Perhaps it is time to undo the damage of the early fifties and plan the development of the country on geographical and practical considerations.